We are a trusted name as Glass Condensers Manufacturer, Exporter and Supplier from Pondicherry, India. The different types of Glass Condensers that we can make available are Liebig Condenser, Graham Condenser, Allihn Condenser, etc. These Glass Condensers are specially designed keeping in mind the delicacy of applications they are meant for. Our Glass Condensers are easy to clean and have long life. A condenser is a device or unit used to condense a substance from its gaseous to its liquid state, by cooling it. In so doing, the latent heat is given up by the substance, and will transfer to the condenser coolant. Condensers are typically heat exchangers, which have various designs and come in many sizes ranging from rather small (hand-held) to very large industrial-scale units used in plant. 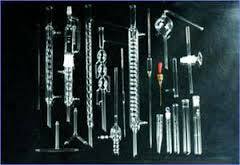 In laboratory distillation, reflux, and rotary evaporators, several types of condensers are commonly used. The Liebig Condenser is simply a straight tube within a cooling water jacket, and is the simplest (and relatively least expensive) form of condenser. The Graham Condenser is a spiral tube within a water jacket, and the Allihn Condenser has a series of large and small constrictions on the inside tube, each increasing the surface area upon which the vapor constituents may condense.